To make the “Best” Bison burger, shape 6 oz. 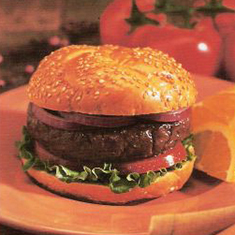 of ground bison meat into a patty about ½ inch thick. Cook on a grill over medium heat to the point that the pink is just disappearing, and serve. Just lightly add a dash of salt and pepper. Either put on a bun or eat it as is, it doesn’t need any enhancements from condiments; it tastes GREAT au Natural! Try it yourself.